The average and median sold prices of homes both slowed down from the previous month, with appreciation slipping 1.41 percent to $404,160 and 0.4 percent to $350,000, respectively. While home prices had a slight decline month over month, Denver-area has experienced a 23 percent boom in average home appreciation values year to date in the past 24 months. "The thrill of victory and agony of defeat are easily interchangeable between sports and real esate," said Anthony Rael, chairman of the DMAR Market Trends Committee and Denver real estate agent. "As the past twenty-four months have shown us, home sellers rejoiced about the rapid increases in home values that enabled many to buy-up in the market, while, at the same time, many would-be homebuyers experienced the agony of being priced out of the market." Come hear some of the most memorable songs in theatre history at the Cabaret! Modeled after Munich, Germany's Oktoberfest is a family-friendly and time-honored tradition. Enjoy a day of fall activities at Chatfield Farms, Ticket price includes access to the 10-acre pumpkin patch and family activies. Beautiful sunsets, soft breezes, greeting the neighbors while you rock in your porch swing…you can enjoy all these pleasures right on your front porch. If you want to enjoy the outdoors more, here are four easy ways to create the porch of your dreams. Find a paint color that compliments your home’s exterior and shouts “I’ve been updated!” Have fun with colors on the floorboards, columns, shutters, front door, and trim, and don’t forget that a blue ceiling keeps mosquitos away, or at least it did 100 years ago. Refinish or replace your old porch furniture. Depending on the look you want and how much space you have, think about scale and function. Choose furniture to suit your activities, to read and relax, or entertain friends with refreshing summer drinks, or watch the children play. Decorate with flowers and plants to add a splash of color and style. Check with your local nursery to learn which plants do well potted, whether the porch gets direct sun or shade, and how large the plants will grow. Decorate for character. Each home has a personality, just like its owners. Search online or the local flea market for treasures like chimes and garden stools. Try the new “living room” style, complete with curtains on a rod and an outdoor rug. 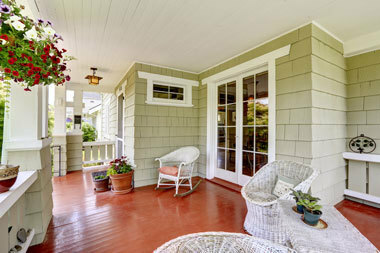 A porch is like a perch – you can use it to enjoy your place in the world, and it has the added benefit of bringing more curb appeal to your home. With mortgage interest rates near record lows, you may want to buy a home before rates go higher. Can you qualify for a purchase loan? Your FICO® scores may be the key. Over 50 years ago, The Fair Isaac Company created credit scoring so that lenders can understand at a glance how much risk you pose as a borrower. “FICO” scores are determined by a software algorithm that analyzes your job, credit, income-to-debt ratios, spending habits and payment history. Base scores range between 300 and 850, and borrowers with the highest scores get the best credit terms. 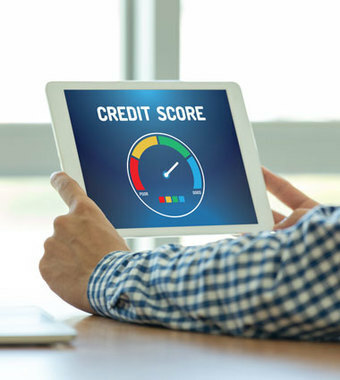 Each credit reporting bureau, Experian, TransUnion, and Equifax, calculates its own score, so review all your credit reports for errors and get them resolved as quickly as possible. Visit www.annualcreditreport.com to get free one-time copies of your credit reports. Credit scores aren’t free, but you can get scores from all three bureaus at www.myfico.com for under $60. Pay more than the minimum payment required. Reduce credit card debt to improve income-to-debt ratios. Don’t open new accounts to consolidate debt or close credit card accounts. Use no more than 30% of your available credit on any card. Don’t change jobs immediately before applying for a mortgage loan. Mortgage lenders are most interested in your ability to repay the loan. Long-term employment in the same field and on-time credit payments are the best ways to build and protect your credit scores. They’re called “roof-over jobs” and they’re more common than you may think. In some areas, codes allow homeowners to install a new roof on top of an existing roof, but it’s not necessarily a good idea. While it can save homeowners money, roof-overs don’t provide the same protection as a single roof where the previous roof has been completely removed. While many building codes allow for up to two layers of asphalt roofing, for example, some homes may not be structured to handle the additional weight. All layers must be removed before a new roof system is installed, if weight is going to be an issue. There are other concerns. Some manufacturers will not warranty a roof-over because the substrate may not be smooth, flat and clean enough. Insurers may also decline to either insure the roof-over or pay for roof damage if there are multiple layers. If you’re buying a home with a multilayered roof, it’s difficult for structural inspectors to do a thorough inspection. This means fissures and leaks could be easily missed. Asphalt roof-overs also super-heat in the summer, which causes buckling that leads to leaks. So what do you do if you’re buying a home that needs re-roofing? The home inspection should reveal any roofing issues, including layers. 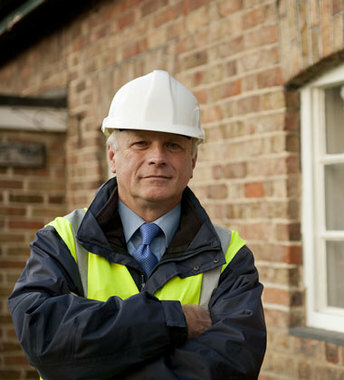 The inspector will tell you the building codes for roofs in your city and what your options are. If you’re buying in a community managed by a homeowner association, there may be additional restrictions on the type of materials you may use. Ask your Berkshire Hathaway HomeServices real estate professional for more information. Many buyers hope to find a home in perfect condition so they can avoid dealing with maintenance issues. The problem is – no perfect home exists, so as a buyer, you should rely on home inspections to tell you what you need to know about the condition of the home you’re buying. Be prepared to hire and schedule several types of inspectors to look at structural, pests, and environmental elements, depending on requirements in your state. A structural home inspection should take several hours and cover all built-in appliances, all mechanical, electrical, gas and plumbing systems, the roof, foundation, gutters, exterior skins, windows and doors. Home inspections may only cover the main house. This is significant for specialty inspections such as termites, because termites are more likely to be found in outbuildings. Make sure any inspection covers all buildings on the property including guest houses, detached garages, barns, stables and other buildings that will convey with the property, even if you have to pay more. Attend every inspection and stay with the inspectors. Seeing problems for yourself will help you understand what’s serious, what needs replacement now or later, and what’s not significant. While home inspections point out problems, they also show you what’s working well so you can make your final decision about the home. You can ask the seller to make repairs, or you can offer a little less. If you’re getting a VA or FHA-guaranteed loan, some items aren’t negotiable and the seller must address them, but otherwise ask your Berkshire Hathaway HomeServices sales professional for advice.